Diesel Treat 2000™ Ultra Low Sulfur Winter fuel additive is specially formulated to provide ultra low sulfur diesel fuel maximum cold temperature protection against fuel gelling, waxing and fuel line freeze-up. Diesel Treat 2000™ contains a highly concentrated, multi-functional additive system to improve fuel economy, injector cleanliness and fuel stability and to optimize performance. Using advanced water dispersant and anti-wax settling agents, Diesel Treat 2000™ provides reliable moisture protection in cold temperatures. This dual action technology eliminates potential icing and waxing issues, which increase the diesel fuel’s cold weather operability. Further blended into Diesel Treat 2000™ is our proprietary lubricity additive, SynShield®, which prevents fuel system wear and injector scoring for longer component life. 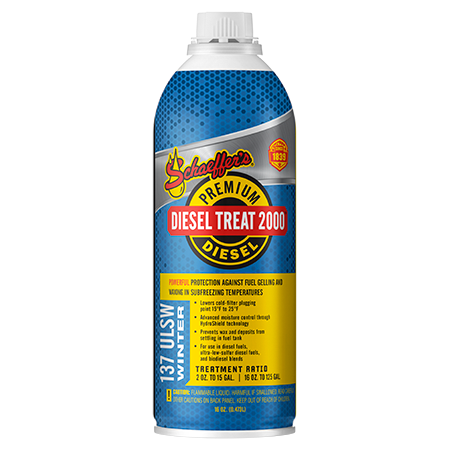 Diesel Treat 2000™ can be used in all types of diesel fuel including low sulfur diesel fuel and biodiesel blends. Diesel Treat 2000™ meets cleanup and keep clean performance as shown by the Peugeot DW10 Injector Depositing Test throughout the entire fuel system. Diesel Treat 2000™ is registered and meets US EPA requirements for blending into low sulfur diesel fuels. Contains less than 15PPM sulfur. Protects against fuel gelling, waxing and fuel line freezing. Improves fuel’s cetane rating 2 to 4 points. Anti-wear protection throughout fuel system. Reduces emissions, exhaust smoke and particulates. Easier cold weather starting and faster warm up.